Following the first, unsuccessful attempt to establish an association football club in Keighley, there was another attempt made in 1896. Or rather there were two simultaneous attempts. On October 1st of that year a meeting took place in the Acorn Coffee House (where the original club had been envisaged a decade earlier), and again the formation of a new Keighley side was discussed. A Mr.Longsden was elected chairman and practice games were quickly organised. Ironically, a first fixture was again against Meanwood. The new Keighley only lost 1-2 this time, with Morris credited with their first ever goal. He same opponents were beaten 3-2 one month later, and other games Leeds and Oulton were possibly played. And then that was that, the new side folding up in double quick time. However, in the mean time, another meeting had taken place in another coffee house. On November 24th 1896 at the Heber Coffee House a ‘Keighley Association Club’ was formed. 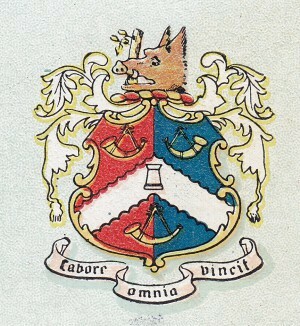 Under the presidency of a Mr.E.Briton, a motion by one Walter Hobson (later to become club captain) was passed and suddenly Keighley had two clubs of the same name. This particular Keighley AFC claimed to have enlisted the services of some of the players from the long defunct original club, as well as two former Darwen reserve team players. Keighley Trinity rugby club placed their ground at the clubs’ disposal and they were underway. The first fixture was not against Meanwood, but Menston, who won with the only goal of the game despite play from the Keighley side that, according to reports, was ‘distinctly promising’. Again, scant press coverage was probably down to a lack of reporting from the club itself, but Shipley AFC’s players were known to have had their festive activities ruined on Christmas Day when Keighley thrashed them 6-1. The new team had actually not got round to registering with the County FA, which caused them at least one cancelled fixture, but by the end of January 1897 the necessary paperwork was complete. Following a relatively successful first season, the club became the first from the town to join a league, when in the summer of 1897 it was accepted into the newly formed West Yorkshire League, and elected to division two (north) alongside Beeston Hill Parish Church, Renshaw Albion, Bowling, Otley, Menston, Bradford Spartans and Bradford ‘A’. The first league fixture took place at Lawkholme Lane on September 11th 1897, and resulted in a fine 7-0 win for Keighley against Bowling. However, the points could not be awarded to Keighley until a league meeting later that month, as the official referee had been sent to Bowling by mistake, and did not arrive at Lawkholme Lane until half time, by which time a home official had taken charge. Things were looking all rosy, and the Keighley Herald reported that ‘there seems to be capital material in the Keighley team’. Keighley were actually joint top of the league by Christmas, and an exhibition game with Bradford ‘A’ played at Silsden rugby ground attracted a larger than usual attendance, probably due to the novelty value of the game.. Despite a dodgy run in the middle of the season, a 5-0 thrashing of Bradford Spartans took them back to the top of the table ahead of Beeston. By the end of the season, that position had been maintained, and a play-off with south division winners Oulton St.Johns arranged. Keighley won the decider 2-1 and the players presented with silver medals by league officials – certainly a bright start for the club in its first ever season. The Keighley team that defeated Oulton was: AL Bairstow, A.Cain, G.Birch, W.Hobson, J.Walker, J.Wade, Corporal Wilks, W.Watson, K.Carlisle, A.Slattery & J.Donoghue. The league’s senior division folded that summer, so Keighley played in the same division (‘North’ division) in the 1898-99 season, with one of the new teams being a certain Leeds United FC. This lot are in no way related to today’s’ team and in this instance failed to complete the season despite holding Keighley to a 2-2 draw on the opening day of the season. This time Keighley found themselves at the wrong end of the table until a late surge saw them rise to third in the final standings, well adrift of champions Ossett who trounced them 9-0 early in the campaign. Over 1000 spectators witnessed the return game with the champions-elect at the Victoria Park ground, raising £11, more than the rest of Keighley’s home fixtures added together that season. However, the majority of spectators had not actually planned to be there in the first place. The cancellation of the Yorkshire v Cumberland rugby match at the adjacent Lawkholme Lane left hundreds of sports fans without a game, many of whom decided to stop off at the Keighley match instead, thus giving the locals an attendance ten times higher than they would normally have expected. It was argued at the time that the recent ‘split’ , which led to what we now know as rugby league (‘northern union’ in its early days) enabled rugby to maintain its dominance over the new ‘soccer’ code, largely because the handling code was now seen as far more interesting for the spectator than it had been before the split. How Keighley AFC would have loved to have encouraged those rugby fans down to Victoria Park week after week. A permanent move to the better Lawkholme Lame enclosure was made by Keighley AFC in time for the 1899-1900 season, but the move did not herald the return of good fortune . Three key players moved upwards that summer, Caine and Walker to football league newcomers Middlesbrough, and Slattery to Accrington Stanley, who at the time resided in the North East Lancashire Combination. An early 24-0 mauling of a depleted Yeadon, when Kenny Carlisle scored seven times, could have led to better things, but as the season progressed events transpired that would lead to the gradual death of the club. On October 21st 1899 a league match with Beeston Hill ended in a discreditable brawl, which resulted in the Keighley club, and its’ ground, being suspended pending an investigation into the matter. The club had already been in trouble that season when S.Black and linesman Wade had been found guilty of disputing the referee’s decision, using rather distasteful language at the same time, which resulted in a one month ban for the latter. Despite the lifting of the suspension well before Christmas, the Keighley side never really recovered as those involved with the club, as well as the spectators, drifted away. Six players failed to appear for a Bradford Cup defeat at Bolton Church, leading to several ‘outsiders’ being called upon, and the local press reported that ‘association is evidently in a consumptive state in Keighley’. It was something of a surprise that the club reappeared for the 1900-01 season. Now based on a ground at Stockbridge, a considerably altered team had dropped into the Bradford & District league, formed one year earlier. Any hopes that success would be found at this level were immediately dispelled with an opening day defeat at Clayton, where Keighley were described as ‘woefully lacking in match practice’. By Christmas, the team was placed ninth of 11 teams, enduring some heavy defeats and enjoying only one victory. That victory was actually awarded when Menston had failed to appear for a fixture in September. It was the Keighley side, however, who began to break their engagements – against league leaders Girlington (the first soccer team to play home games at Valley Parade) and Undercliffe-based Airedale, leading to fears as to the continued existence of the club. These fears were well founded, and by February 1901 another short-lived Keighley club had bitten the dust. Rob’s account of the original Keighley soccer club as told on VINCIT can be found through this link..